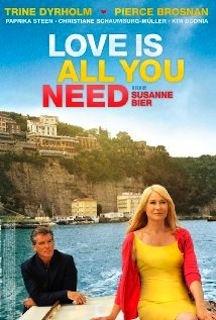 Review: “Love Is All You Need” signals Susanne Bier’s return to comedy, after several years evincing great eye and solid hand for drama (“Open Hearts”, “After The Wedding”, “In A Better World”). The result was extremely disappointing; her weakest work so far. Patrick and Astrid decided to leave Denmark to get married in an old villa in Italy, where their families will join them. It’s excused to say that a pile of conflicts, dilemmas and separations will occur. Groom’s dad (Pierce Brosnan) and bride’s mom (Tryne Tyrholm) will become the beneficiaries of this gathering. Consecutively, and using a recurrent cheesy tone, we can witness the deep transformations on every single member of both families involved. I wouldn’t have nothing against it, if the plot wasn’t simultaneously predictable, weepy and drastically messy. This story falls between sloppy comedy and overdramatic romance, where all the tension created among the characters was wrapped in triviality. Dean Martin’s tune “That’s Amore” annoyingly fills our ears over and over again, in a movie that was only able to impress through its beautiful southern Italian landscapes.